The rooster begins crowing at around 4am, and doesn’t stop. The cows moo, all the time, some sounding totally pissed off, some sounding suspiciously like elephants. New sounds, exotic bird songs fill my mind. I begin to whistle along. The sun comes up hot and strong, bringing me out of bed to greet another day. It is the wet season, and we often have early morning rain, heavy downpour exaggerated by the tin roof. Usually by the time the sun comes out the dark clouds have passed, and by midmorning teatime, it is scorching. This morning it is so clear I can see snow covered Mount Kenya. We, a small intergenerational group of Americans, are here as part of Beyond Boundaries, a non-organization or ‘organizing principle’…. a dreaming of cross-cultural collaboration, co-creative learning, and bearing witness to good work being done ‘beyond boundaries’ of race, religion, age or gender. We have traveled together before, in the world and in our home communities, responding to requests and invitations, and offering ourselves in service. Our host is Kithoka Amani Community Home (KACH); part of International Peace Initiatives (IPI) founded by Daktari (Dr.) Karambu, a local woman with a big heart and a big vision for her people and for women globally. She started IPI as part of her Communications Doctoral thesis at University of Colorado. She started by listening to her community; to the people she saw needing listening to, the impoverished women with HIV/AIDS. They wanted income; she helped them to create their jewelry and handcraft workshop. Their number one worry was ‘what will happen to our children when we die?” KACH was born from this concern, and is now quickly growing to accommodate the children who need a safe place to live. 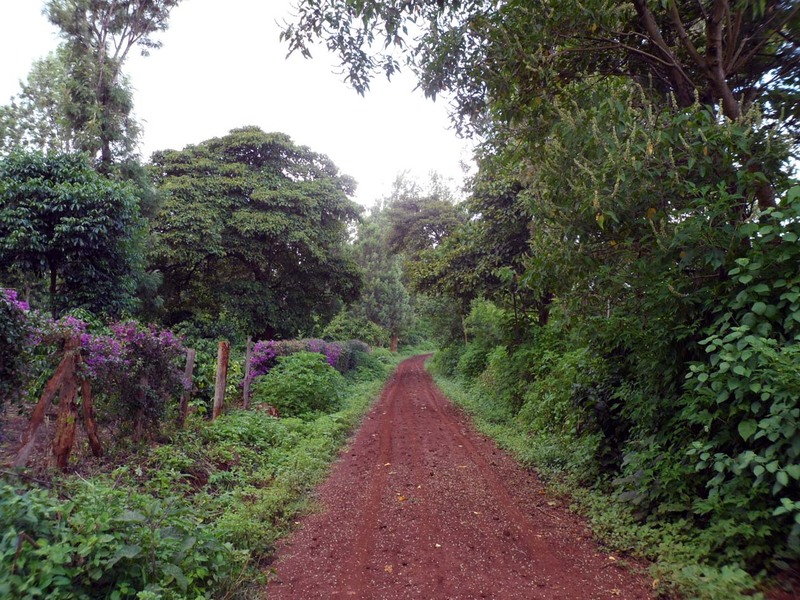 Karambu has a vision to create a peace academy, an intentional community… a new culture of peace. Karambu has a quiet presence, a stillness and depth that is apparent in the way she listens, leads and participates with her community. Yesterday I saw her scrubbing windows, stirring onions over an open fire, and fetching materials for the hired labor. 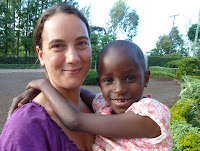 In addition to running the organization, fundraising, hosting volunteers, and being ‘mama amani’ for the children’s home, she has become an active facilitator for the UN womens movement in Kenya and travels often to various regions to hold workshops for women and youth. Karambu invited us after meeting Marlow Hotchkiss, one of our team, at the Findhorn Foundation. She participated in a ‘Nature of Council’ course Marlow and his wife Leslie offered there. In this experience she met something she saw would serve her community and vision, and now we are here. We are at the mid-point of our project, building a peace hut, a round natural earthbag building for prayer, contemplation and council. For the children… in the center of our worksite a prayer hangs on our orientation pole (helping us to keep levels, distances and direction). It says ‘Kwa Watoto Wetu’, ‘for the children’ in Swahili, and is covered with the drawings and the wishes of the Amani children. 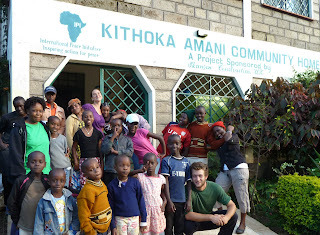 “Amani’ (Swahili for peace) is a small sanctuary, a beautiful compound full of energetic children and a friendly staff. We arrived as their Christmas break began, many of the children returning ‘home’ from boarding schools, and we quickly learned the names of the 20 plus kids, and how to play with them. It is always the quickest way to bridge culture… jump right into the body, to physical play, sports, song, art. In the first days unknown children would shyly bring me crayon drawings and love letters, and in the following days I joined them to paint their portraits. We began to fall in love. They all have hard stories; most have HIV positive parents and/or lost their mother during birth. Globally 536,000 women died in childbirth or pregnancy in 2005. “Child mortality has plunged, longevity has increased, but childbirth remains almost as deadly as ever… lifetime risk of maternal death is one thousand times higher in a poor country than the west.” I am acutely aware of the global context of the local situation here through reading “Half the Sky” by Nicholas D. Kristof and Sheryl WuDunn. Most of these deaths could be prevented. Facing this reality, the question Kristof and WuDunn posed is: Why? In brief, the answer in biology, lack of schooling, lack of rural health systems, and disregard for women. It is clear that part of this great shift we are facing has to do with change in gender dynamics, and a change in the global situation of women. It is a hot topic here, not broached lightly but constantly in the field… Karimi (one of our beautiful and joyful kitchen mamas) was wearing a t-shirt yesterday reading ‘NO to FGM’ (FGM = Female Genitalia Mutilation), the message on the back called for education for girls. While things have been changing here, especially quickly in regard to FGM, it seems there are ideas about gender that desperately want to be changed. After a weekend council training with local people and muzungus (foriegners) I came across a group of men and women discussing a moment they had witnessed in our council… a married woman (a muzungu) affectionately showed her appreciation and gratitude to another man.. and her husband was smiling! They were excited, what would it be like to live in a culture free of jealousy? Is it possible? Christina, a bright young intern from Germany, is writing a paper for her Masters study on International Development, focusing on women’s empowerment. She surveyed local high school students on their views of gender and marriage and found that cultural ideas favoring men are strong in the next generation. One young man responded to the question, ‘should women be beaten by their husbands?’ with ‘if they do something wrong they should be beaten or even killed.’ A positive trend was noted: it seems the younger girls were more hopeful, looking for and believing in change. We do not come with any ‘solutions’, band-aids or aid philosophy. We come with a practice of listening, and a vision to create a sanctuary for listening… to one’s self, one’s community, and the world. We are sharing the practice of council, both formally and through ‘living’; beginning our work each day with a simple circle of bodies holding hands, listening together before beginning a day of mixing mud and sand to create a round building, bag by bag. As the council hut has grown, row by row, bags stacked like bricks, one of our co-workers ‘Dennis’ has repeated the mantra “we are learning”. This is true, we are learning together. Beyond the building technique, we are learning about working together, cooperation and co-creation. Sam, our youngest, shared a Rilke quote in our circle today: Everything is gestation and then birthing. We are here, at this time of great turning, witnessing change. We are being asked to participate, to share our practices, and contribute to this vision of healing, here. We are faced with many questions, and our conversations are rich. When do we trust the process, trust in the gestation and birth of a new culture, when do we intervene, speak up, take a stand. I am reminded of my dreams, a clear and lucid message telling me that I am, we are, the midwives of a new culture. We must trust the process, trust the body knows how to give birth… and we ‘show up’ when there is crisis, when we are needed. “…There is a river flowing now very fast. It is so great and swift that there are those who will be afraid. They will try to hold on to the shore. They will feel they are being torn apart, and they will suffer greatly.